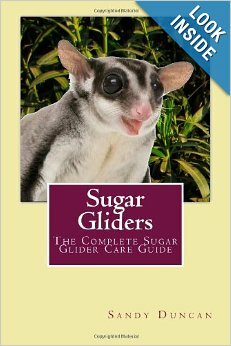 Q: I am getting a Sugar Glider, and need to know where to get a sugar glider cage in southern WV. Mine is way too small. Also, will bird toys, and hamster toys work? Baby toys even? He only has a wheel. Plus a hard-plastic tube for bed-time. A: I am not familiar with where you could get a cage in WV, but it would probably be best to purchase one online if you cannot find one in your area. My cage is from Custom Cage Works, and they have a large selection of sugar glider cages to choose from here: http://www.cageworks.com/cages/88. You can also find many other places online to buy a cage if you just browse around. Bird, hamster, and baby toys will work as long as there are no choking hazards. Do not give your glider anything wooden because the wood can splinter and hurt your gliders mouth. Also, don’t give your glider anything with seeds. Hamsters like to have toys with seeds but this isn’t good for a glider, so avoid things like that. My glider has a few fake branches in her cage (usually designed for birds) and she loves them. Check out my post about sugar glider cages, because I give some tips for how to decorate and design the cage. And most definitely, you’ll want to put some sort of comfy pouch in your cage for bedtime. A plastic tube might be fine but gliders like to be in pouches, preferably hanging from up high, while they sleep. Q: My fiance and I have recently acquired 2 sugar gliders, one is 10 months and the other is 11 months. We got them given to us as a bonding pet for our baby that is due in June. Any advice as to get them bonding better with us because weve noticed they tend to bite now and again. It doesnt hurt or break skin but it wouldnt be good for our babies new ‘little friends’ to be biteing him. Oh and another question about my cage. It’s about 3 – 3 1/2 feet tall, 2 feet long by 18 inches deep. Is that a good size for them? A: This is an interesting question. I have heard of sugar gliders bonding well with children, but I don’t know anything about babies. What I do know is that there is no sure-fire way to make sure your gliders do not bite. Gliders bite for different reasons, being out of fear or curiosity. When they give you little nibbles, it is their way of checking you out (my sugar glider does this to me even after 5 years of bonding). They will want to do this with a baby, I imagine. Another thing I would be concerned about is that you cannot control what your baby does, either. If your baby goes to grab the glider or does something frightening, the glider could bite your baby out of fear. I would be more worried about this because this will be a hard bite. Also, depending on how well you can groom your glider, I’d be afraid of their sharp nails. If you are going to let the gliders crawl on your baby, your baby could get seriously scratched. After having said this, I will say I don’t think it’s impossible to have a baby and sugar gliders at the same time. But I would recommend you keep them separate at least until your baby is old enough to understand the dos and don’ts with sugar gliders. Check out my post about bonding with sugar gliders. I talk a lot about how I bonded with my glider and you can get ideas on how to bond with yours. I have a single glider so my bonding experience will be a little different from yours, but in general the idea is the same. The more time you spend with your gliders and interact with them, the better and faster you’ll bond with them. I think for now, because your gliders are young, your cage is a fine size. But in a couple of years, you might want to look into getting them something a little bigger, especially if they spend a lot of time in their cage. I hope this is helpful. Please keep us all updated on how it goes over with your gliders when your baby arrives. Good luck! Q: A friend of mine just gave me her sugar glider because she no longer had time for it. Now that I have him in my home, I am kind of scared to pick him up out of his cage because I’m afraid he will get away from me. What is the best way/time to pick them up out of their cages? I don’t want him to suffer from depression from not having enough bonding time, but I also don’t want to lose him. Is there anything you can suggest for my problem? A: The best time for play is in the evening or at night. This is when your glider will naturally be waking up and ready to start his day. I usually like to allow my sugar glider some time in her cage after she wakes up before I let her out because she urinates and defecates quite a bit. To pick your glider up, use a cupping motion with your hand and let the glider jump onto your hand. It’s easier to let your glider cling onto you rather than trying to grab at your glider. If this doesn’t work and your glider runs away from you, you can just wait until your glider goes into its pouch and take the pouch out and then kind of just turn the pouch inside out to get your glider to come out. 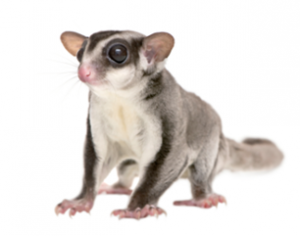 Before you’re ready to start play time, you need to decide if you want your sugar glider to mainly stay with you on your body or if you want him to have more freedom to explore. You might want to find out how your friend raised him to know what to expect of his habits. If you want him to mainly stay with you, you need to pick him up and put him back on your body whenever he jumps off. If you do this enough, he will stop trying to get away from you. You can allow him off your body to play and with persistence, you can train him to come back to you when you call his name. You can do this by coaxing him with a treat. If you want to allow him more freedom, you need to make sure your room is sugar glider proofed so that he cannot get out. I use weather stripping at the bottom of my doors to make sure my little girl can’t get out. Then, once you’re sure the room is secure, you can allow him to explore as he pleases. etc. If you keep a close eye on your glider, you should quickly figure out what kind of adjustments you need to make to keep your glider and your things safe. 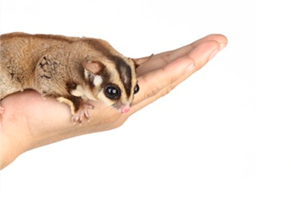 Sugar gliders will urinate and defecate whenever and wherever they please, so be prepared to clean up after him whenever he is out for play time. Don’t be scared to let your little guy explore and be patient as you and him are both learning how to play together. 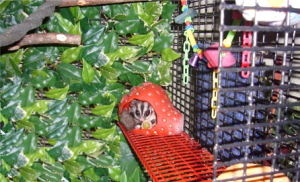 Preparing an appropriate sugar glider cage is the first thing you need to do when you get a pet glider. 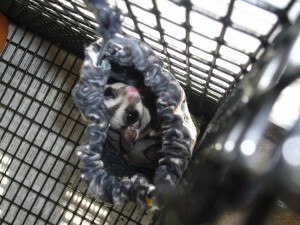 For a pair of gliders, you will need a cage that is at least 24″W X 24″D X 36″H. Bird cages are sufficient, but cages made specifically for sugar gliders are better. Sugar gliders like to be up high, so if you can elevate your cage at all, it will help make your baby feel safe (especially if you have other pets). At first, the cage should be set up with a wheel, a pouch, food bowls, a hanging water canteen, and a tray with newspaper on the bottom. It is best not to fill your cage with toys when you’re initially bonding with your glider. You want to keep your cage pretty bare at first because you want your baby to bond with you and not his/her things. After a couple of months, you can start gradually adding to your cage. You can give your glider bird toys, fake branches and leaves, toys that hang from the ceiling of the cage, pouches and hammocks, and any other non-toxic toy you can find (just nothing too small, you do not want any choking hazards). You can have fun and be creative decorating the cage. I used leaves intended for an aquarium and wrapped them through the bars of the cage so the backdrop would look like vines. I also cut up a piece of felt and tied it to the ceiling to create a hammock. Pokey loves sleeping in there! I added to the cage several tiny stuffed animals that my glider likes to cuddle up to, and a bean bag toy that she likes to sit on. In addition to her primary pouch, I added a bigger pouch that I put a towel in with some plastic leaves, and she’ll opt to sleep in there sometimes. I used the pouch that came with a set of bed sheets and she loves it. I have two of these bigger pouches, one in her cage and another than hangs off the top shelf that her cage is on. There are many things you can do to make your cage comfortable for your baby, just make sure whatever you give him/her is safe. It might take a couple of days/weeks for your glider to use something new, and this is normal. Gliders are very aware of their surroundings and when something new is introduced to them, they might take a little while to feel comfortable, but when they do, they will love the new addition. Another important issue is cleaning your cage. It is best to clean your cage and anything in it as often as you can. Keeping the floor of your cage as bare as possible will be best for allowing any urine and feces to fall through to the tray. This will help keeping linens and toys clean, but it is possible your glider will urinate anywhere in the cage, so cleaning often is necessary. I find the best way to clean my cage is to take everything out (except the leaves) and wash it off in my bathtub. This is quite a process, so sometimes in between major cleanings, I will just wipe down her cage with some clorox wipes and rinse it thoroughly with wet towels. Also, make sure to change out the dirty newspaper at the bottom of the cage at least once or twice a week. 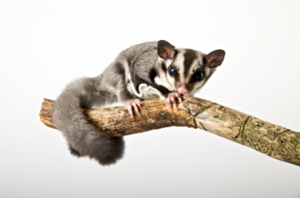 Cleaning your sugar glider cage often will help keep your sugar glider healthy and cut down on the smell of the cage.